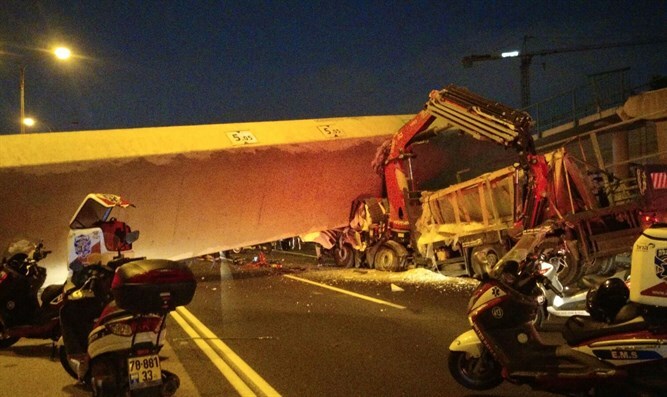 Bridge connecting Bnei Brak and Givat Shmuel, which collapsed when a truck collided with it, will be repaired within a month. For several months, residents of Bnei Brak and Givat Shmuel have been forced to make a detour in order to cross the Geha Highway without risk, after the bridge connecting the cities collapsed when a truck collided with it this past August, killing one person. In some cases, careless citizens were seen crossing the busy road while endangering their lives. Testimonies regarding these incidents were provided by local residents who turned to the Knesset's Special Committee for Public Petitions. MK Yisrael Eichler (United Torah Judaism), who heads the committee, led a discussion on the issue on Monday, at the start of the Knesset's winter session. Eichler demanded during the discussion that the bridge between Givat Shmuel and Bnei Brak be reopened as quickly as possible. During the course of the discussion, the committee was informed by the representatives of Netivei Israel (National Roads Authority) and the Israel Police that the work on repairing the bridge will be accelerated and will be completed by next month, in contrast to the original plan according to which the work would only have been completed next year.